Wednesday’s coordinated worker delegations should represent the largest mobilization of OUR Walmart members since the Black Friday strikes. On Wednesday, workers in at least 150 Walmart stores plan to confront local managers with demands for change in the retail giant’s scheduling system. Scheduling issues have been a recurring focus for the union-backed retail workers group OUR Walmart since its founding. Workers have charged that insufficient and erratic work schedules consign them to poverty, wreak havoc on their personal lives and shortchange customer service. At an October forum, backroom receiving associate Lori Amos said that because of understaffing at her Washington State store, 2,000 pounds of Halloween candy didn’t make it onto the shelves until it had expired and changed color. At a January address to the National Retail Federation, Walmart US President Bill Simon announced that the company was “working on clarifying the opportunities that we offer,” and would act to “bring more transparency into our scheduling system,” and “make sure that part-time associates have full visibility” for full-time openings. Three months later, OUR Walmart charges that the situation hasn’t improved. “I haven’t seen any associates that were part-time, that were requesting more hours, getting more hours,” Lancaster, Texas, worker activist Colby Harris told The Nation. Rather, he said, his store has been increasing its use of temps, and “I’ve actually seen associates get less hours.” Walmart did not respond to a Monday morning request for comment. If organizers’ estimates hold, Wednesday’s coordinated worker delegations will represent the largest mobilization of OUR Walmart members since last November’s Black Friday strikes, in which organizers say some 400 workers walked off the job. In some stores, workers will go together to talk to management before or after their shifts; in others, workers will do so during the work day. (Federal law generally protects the right of workers to engage in such “protected concerted activity” when aimed at improving working conditions.) While the delegations’ shared date and message may amplify attention, their greatest significance will be as the latest test of rank-and-file OUR Walmart leaders’ ability to mobilize co-workers amid fear of retaliation. 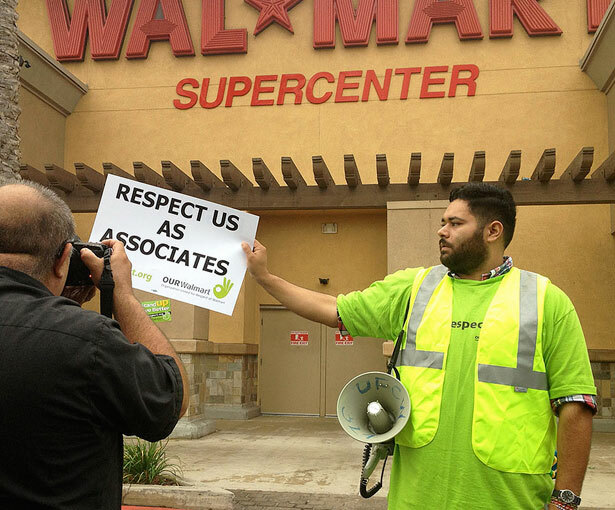 Tomorrow’s planned action echoes the store-by-store skirmishes with local Walmart managers in 2011 and 2012 that developed worker leaders, distinguished the OUR Walmart campaign from recent failed efforts and laid the groundwork for last year’s strikes. The number of new leaders who pull off delegations Wednesday, and the number of newly-mobilized co-workers who join them, will offer some sense of the campaign’s progress towards building a mass movement within Walmart’s 1.4 million-strong US retail workforce. Wednesday’s delegations will follow protests last week over conditions in Walmart’s global supply chain, and the submission today of a new round of internal ethics complaints regarding alleged bribery in Mexico and elsewhere. Update (10:40 am Wednesday): Organizers say that delegations are taking place at over 150 stores. While Walmart workers around the country confront managers over scheduling, retail workers in Chicago are joining fast food workers in a one-day strike, the latest in a wave of low-wage, non-union work stoppages that began in the Walmart supply chain last year. From the Bronx to Brooklyn, New York’s low-wage workers are rising. Read Lizzy Ratner’s report.